I sometimes wonder why it is we go through life taking so much for granted, too busy to stop and question why things are the way they are, whether they be circumstances, events or what we eat. For example, I often think about food and associated traditions, such as the origins of the Christmas plum pudding or the Easter egg. As today is Anzac Day in Australia, it occurred to me that I’d really like to know about the history of the famous Anzac biscuit. Every Aussie kid grows up eating Anzac biscuits and even though they are readily available throughout the year at supermarkets, they suddenly appear everywhere during the weeks leading up to Anzac Day. When I think about the Anzac biscuit, I’m taken back in time to primary school where I first baked them in home economics class. I remember eating them at school fétes, church fairs and anywhere else you would find a cake fundraiser. In my opinion the Anzac biscuit is as Australian as the lamington. The Anzac biscuit recipe was developed for the Australian and New Zealand soldiers fighting in the first World War and is based on a Scottish oat cake, also known as a bannock. 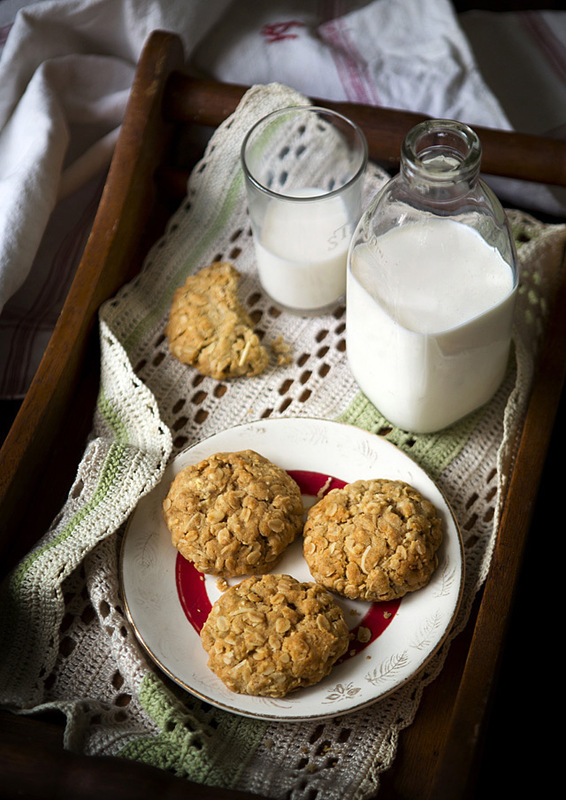 In a study by author Sian Supski of the significance of Anzac biscuits in Australian history, she states ,“the biscuits not only remind us of a time that was seen as pivotal, but they also signify women’s input to the war effort on the home front”. When sending provisions abroad to soldiers, the women were faced with the issue of spoilage as the food sent over usually didn’t make the long journey, so they created a biscuit recipe that would stay fresh. There are no eggs in the recipe for this reason and the binding agent in the biscuits is the golden syrup. At first the biscuits were called Soldiers biscuits, but after the landing on Gallipoli, they were renamed ANZAC biscuits (after the Australian and New Zealand Army Corps). I set about creating a gluten-free version and after many batches I found that the combination of sorghum flour, brown rice flour and tapioca starch (all in place of the traditional wheat flour) gave the best results. The optimum quantity of butter to use is 125 grams (approximately 4.4 oz), any more than this and the dough becomes too liquid-y and the biscuits spread out too much. In recent times I have very much enjoyed working with sorghum flour for cookies and biscuits and even though it can be a little hard to find (I use Bob’s Red Mill), it is worth the effort. If you want Anzac biscuits which are chewier make them bigger, if want them to crisp up more make them smaller and flatten the out the dough more. The best sugar to use is the moist brown type (you could also try rapadura) as it helps bind the gluten-free flours together. So I’ll close this post on a more sombre note than usual and express a deep, heartfelt gratitude to all the men and women who gave up their lives to fight and serve during the two World Wars. Nothing can bring back the lives lost in battle, but at least we can stop and remember them on Anzac Day, and maybe even eat a biscuit or two in their honour. Makes 12 large or 16 smaller biscuits. Prep time 15 mins, cooking time 20-25 mins. 1. Preheat the oven to 160˚C (320˚F). Line two baking sheets with non-stick baking paper. 2. Combine the oats, coconut, sugar and flours in a medium mixing bowl. Set aside. 4. Add the wet ingredients to the dry and combine. 5. Scoop up walnut sized pieces of the dough ensuring you squeeze the balls in your hand to compress them. Place the balls of dough on the baking sheets. Slightly flatten the balls with the palm of your hand. 6. Bake for 20 minutes for chewier biscuits or 25 minutes for crispier ones. Remove from oven and cool on the rack for at least 10 minutes before transferring to a wire rack. These biscuits are soft straight out of the oven however will harden upon cooling. I wanted an image which evoked the early Australian war years. This image was shot by window light, almost in the dark, as the last light of the day faded. The old timber tray was picked up at the Salvo’s, as was the glass and crocheted doily. The old plate was found in a hard rubbish collection and the vintage milk bottle was a gift from a neighbour who had kept it for years. The beautiful vintage European tea towel was purchased from a seller on Etsy. I worry that I take too much for granted. It’s good to stop every once in awhile and think about why things are and how things came to be. I love the styling here and I love that you’ve explained its origins. After all, almost every food or its item has a story behind that’s worth sharing. Just sometimes people (including me) are too busy to learn it. Thanks again!